dance.net - Another "have you seen this dress" post (10084070) - Read article: Ballet, Jazz, Modern, Hip Hop, Tap, Irish, Disco, Twirling, Cheer: Photos, Chat, Games, Jobs, Events! I know the girl I sold it on to sold it to someone in Norfolk, England but it could have gone to any organisation or indeed could have been sold on again. Obviously it's not very current so I assume it's just cluttering up somebody's beneath-bed area, however I would be happy to recompense the owner for its return if they wanted me to. Any leads? I'm not very hopeful but thought it would be worth a shot. 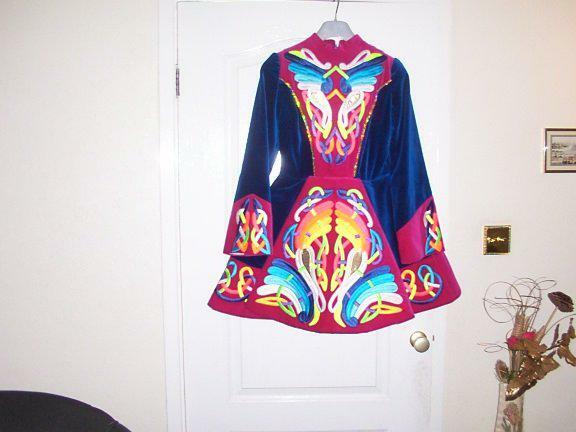 I would fit someone about 5'5'' or thereabouts, is pink and deep blue (not navy and red as it sometimes looks in the photo), has a gold lining, and a kite-shaped white cape with a scalloped gold edge. I saw your post and just had to say this-- about ten or so I saw this dress on dance-again (I believe...I have no idea if it was you selling it or not) and wanted it more than anything in the whole world. I printed out a picture of it and taped it to a peanut butter jar that I filled with my babysitting money...but when I finally had enough it was gone. Best of luck finding it, seeing this picture on here again brought back the old excitement of looking at it every day! I really hope you are reunited. I wish I could be of some help! While I am no help, I do hope you find it! Since its last known whereabouts was the UK, I suggest posting a link to this thread on the UK board. While ddn gets more serious posters, for sheer numbers of readers, the voy boards are a good option. I will post a link on the MWR board for you. PS. Here's a link to the MWR voy board post. Hopefully, you'll get a lot of people looking at your inquiry. I haven't seen your dress, but I'd love to see you reunited with it. Here are some ideas as these are some places I am looking for for solo dresses and there are so many sites out there. Best of luck!